We are less than a week away from the debut of the Petro-Yuan-Gold, a landmark moment that may mark the earnest beginning of the end of the USD as the de facto currency of global trade. 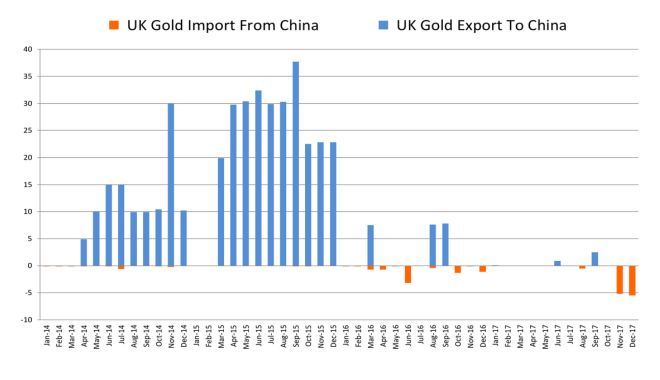 So why is China suddenly shipping gold to the UK? 1. The Chinese want to purchase gold at as low prices as possible for as long as possible, so that they can purchase gold cheaply and because they don’t want the volatility because it would affect the volatility and thus credibility of the Yuan as a reserve currency. 2. The Chinese want to be able to deliver the counterparts of the Petro- Yuan-Gold contracts (going life on March 26) with the physical gold going into their vault holdings in London (the Saudis have a strong London presence) because the London LBMA/BB vaults don’t have enough physical gold to meet the demand (13 week backwardation) that could stem from the new contract and as a result the Petro-Yuan-Gold contact would fail which would be a blamage for the Chinese and severely tarnish their credibility on their road to Yuan convertibility. And thus the more interesting it will be to see what will happen in the run up to March 26 in terms of EFPs and the gold price development.